All my childhood, my hair was proper short - to the extent that I'd sometimes accompany my father to the barbers for a short back and sides! In my 20's, I tentatively tried out some longer styles but I have never had it as long as it was most recently - the two pregnancies definitely thinned out my hair enough to allow it to be manageable in a longer length. But the truth is I've been bored with it over the past 6 months. Long hair is hard work & high maintenance. It gets into your food, sticks to your lip gloss and catches on zippers and buttons and I don't see the point in having long hair if you just always tie it up. 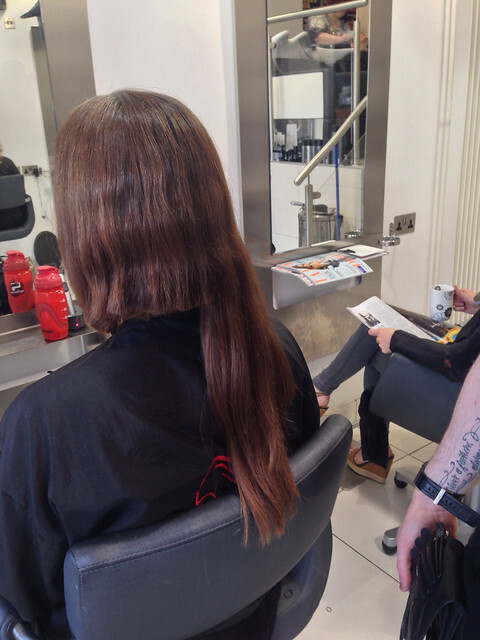 Over recent months, I've met several women with amazing shorter hair - edgy, choppy and on-trend and my long heavy hair seemed very frumpy and a bit mutton all of a sudden. So it was time for the chop! But not just a few inches here and there - a whole 10 of them! Here's the before - last chance to back out...!!! 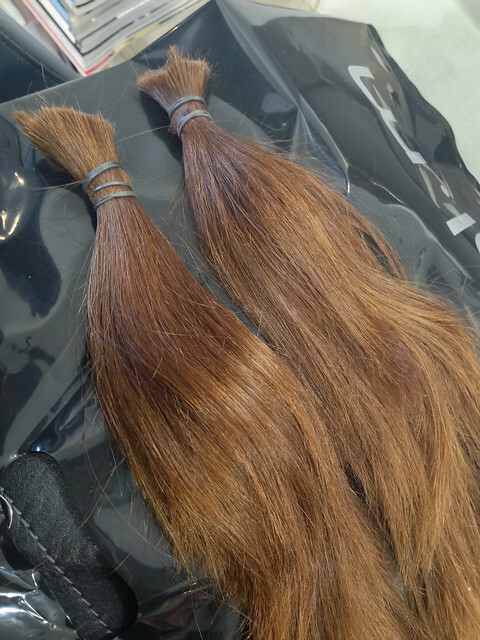 and here's what came off - two lengths of hair that are currently winging their way to the Little Princess Trust - a charity that supplies wigs to children with alopecia and those undergoing cancer treatment. I found out about this charity recently thanks to a friend who shared a picture on Facebook and it had been in the back of my mind as I contemplated a new style. However some of the hairdressers I approached about this seemed to not know that coloured, bleached and even grey hair can be donated. Other hairdressers wanted me to come in advance of my appointment to see if my hair was suitable. But the fact is, you can send it to the Little Princess Trust as long as it's clean, product free (conditioner is ok), tied at both ends with elastic and is at least 7 inches long. And it can be coloured, bleached or grey...just not chemically straightened. And you can post it yourself in a clear plastic freezer bag, inside a padded envelope - you don't even need your hairdresser to do it for you! So don't be put off by mis-information. Full details of the criteria is available on the LPT website. And here's my new hair...cut with great skill by Jonathon McKelvey in Uber Hair on the Lisburn Road, Belfast. 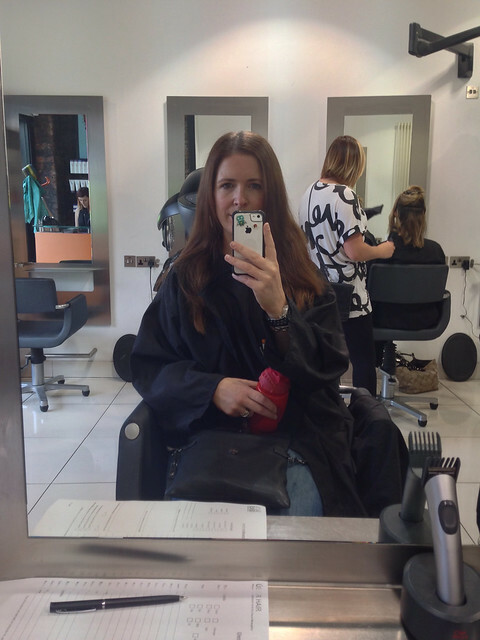 I also had my colour done - hence it's a bit darker - my hair lightens hugely between colours...always to an auburn colour like you see in the ponytails. 36 hours on, how do I feel? Well I've no regrets - luckily! Instead, I feel like my hair is back to its roots (scuse the pun) and I absolutely love it. It feels like a fresh new start. Perhaps my wardrobe will have to completely change to fit with my new hair!??! A HUGE thank you to everyone for your lovely comments yesterday all over social media - it was amazing to have such support and to those generous lovely people who suggested I set up a Just Giving page - thank you for the prompt as I never thought about doing that and of course I should have! So if you have a few pounds to spare and want to support the Little Princess Trust financially (as the wigs cost a LOT to make), you can do so on this link. I think you look fabulous and as I predicted yesterday morning, you look so much younger. I'm almost tempted myself!!! That is quite a change but it looks wonderful, short hair really suits you! Summer is the perfect time to chop it all off, I just can't be bothered with maintaining a shorter style so stick with boring long locks. Really love this Avril & what a great idea donating it. More salons need this information! I love your new hair do and wish I had the guts to do something like that. The last time was seven years ago when I got it chopped into a pob after I had Ben. I loved it but the maintenance I didn't love so much so I've tended to stick with longer hair. I think it was a fab move! I still can't get over it but I seriously love it! I always thought you looked great before your new do. But you now look truly amazing, well done you. Love your new haircut Avril it looks absolutely stunning & what an amazing thing to do with your old hair. Amazing! You look fab! 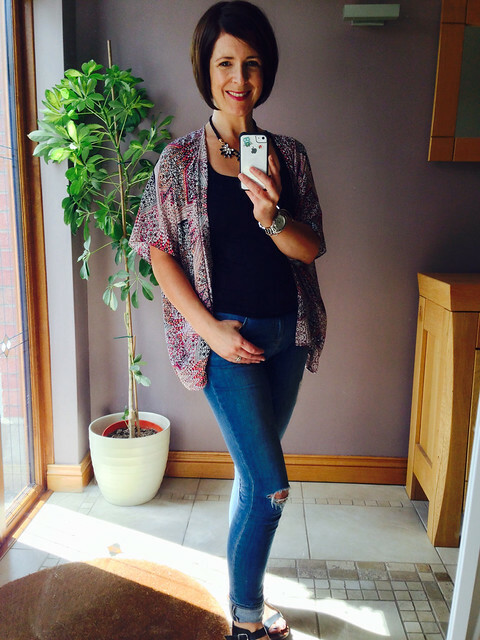 I think we might be hair twins I also had short back and sides until aged 14 then discovered I have thick curly hair which had been below shoulder length but then last Friday I am proud owner of short, graduated bob! 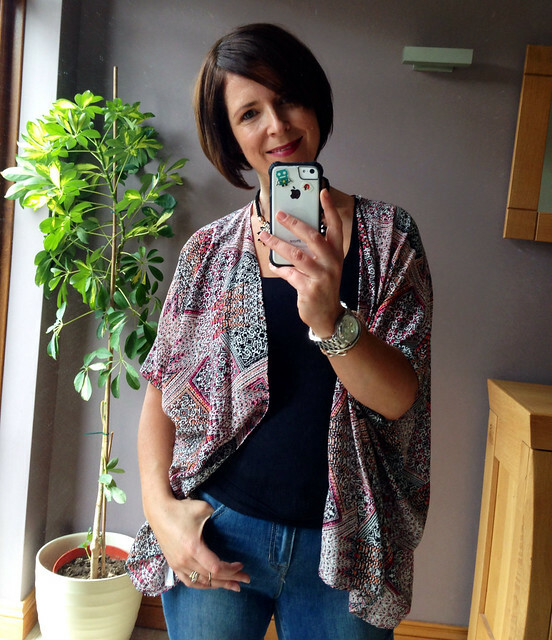 Feel like I have a new lease of life - and love feeling breeze on the back of my neck - enjoy! You look amazing! I love the shorter look. Beautiful. And the outfit looks amazing. There's those jeans again that I LOVE!! It looks fabulous. I recently took a bit off my starting to get too long hair but now I am wondering if I should go shorter again. You look stunning hun! I love, love, love the cut. And what a great charity to give your hair to. Your entire wardrobe will take on a new style now I am sure. I absolutely love it Avril, looks so fab! I liked it long as well, you are lucky that you can do both! I think you look absolutely amazing. I tie mine up ALL THE TIME so I'm wondering if I shouldn't just get a buzz cut instead? Wow Avril, I gasped out loud at the second photo. It looks fabulous though and makes you look both younger and thinner (the holy grail). Waiting to hear how you get on, often tempted but fear the maintenance. I LOVE your hair! I didn't know you can donate grey, colored hair because that's my hair type! Hi Avril I am not sure I have commented before (but I have bought one of your scarves!) Just wanted to comment on your hair - it is FANTASTIC! You look so chic! I think the donation idea is brilliant too. Well done for being brave enough to do it - so many women aren't - and yet usually it looks amazing when they do.